GRAFENWOEHR, Germany — While the seasons change and leaves start to fall, imagine Medieval castles illuminated by Christmas lights and small stalls offering everything from traditional food, candy and drinks to handmade local tree decorations, candles and hand-crafted wooden toys like vintage merry-go-rounds. Germany is home of the ‘Christkindlmarkt,’ or Christmas market. These festive markets offer traditional delights for your senses. Aromas of Gluehwein (spiced mulled wine), Lebkuchen (gingerbread) and sausage fill the air as you wander through the cold markets, soaking up the festive atmosphere of the Christmas season again. You cannot find a better place to enjoy it than a snowy winter in Germany! Go ditch the mall, and make the journey to a Christmas market, where you can exchange crowded department stores for lovely wooden chalets and experience a down-to-earth holiday cheer. Some of these street markets date back to the late Middle Ages and can be found throughout Germany — both in big cities and small villages alike. Traditional and popular elements of the holiday season are combined and topped with a good number of regional highlights. Below you can find a hand-picked selection of Christmas markets — most within a three hours’ drive from Grafenwoehr. It includes some of the largest, oldest and most beautiful markets in Germany, as well as Austria and the Czech Republic. This list also includes local markets in Grafenwoehr’s neighboring communities and some very unique markets, such as the one around Auerbach’s iron ore mine. Some of the markets held in castles or other special locations charge admission fees. Children often get discounts or free admission, and some might offer discounts for soldiers or DOD affiliated personnel. Just be sure to ask. If you are interested in smaller and local markets, pay attention to the dates. Some are open for a single day or weekend only. Most markets are open from noon until approximately 8 p.m. Some Christmas markets may have longer opening hours on weekends. Larger markets that run until December 23 or 24 will usually close by noon on the last day. 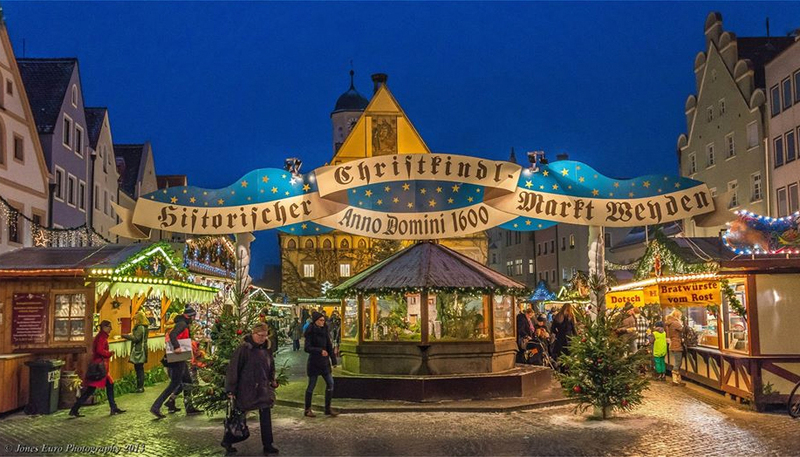 For more Christmas markets locations, visit the German listing site, and look for the A to Z drop-down menu on the left side of the page.